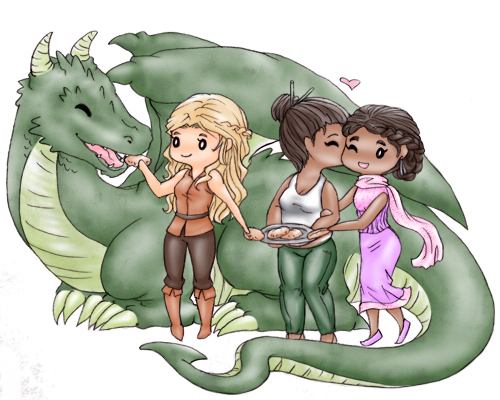 Artwork by Yeaka of the four main characters of the series: the dragon, the warrior woman Rivka, the chef Aviva, and Queen Shulamit. The third installment, A Harvest of Ripe Figs, is due out on January 21, 2015. Image | This entry was posted in Uncategorized and tagged books, chanukah, Dragon, family of choice, fantasy lit, hanukkah, holidays, jew, jewish, jewish fiction, jewish holidays, judaism, latkes, lesbian, lesfic, lgbt, lgbtq. Bookmark the permalink.